Oyster House01485 528327work Bed & BreakfastEscape to the peace of rural north Norfolk and enjoy a comfortable and relaxing stay at Oyster House. We offer family run 4 star silver award Bed & Breakfast accommodation with a friendly, informal atmosphere and an ideal base from which to explore the North Norfolk. Located in the village of West Rudham, close to the area's famous coastline with its beaches, marshes and pretty flint villages we're within easy reach of the sea and its attractions but away from the crowds of the traditional holiday hotspots. With a central location and good road connections, we're well placed for exploring the areas stately homes, gardens and ancient sites, or browsing round the shops and galleries in Burnham Market and Holt. 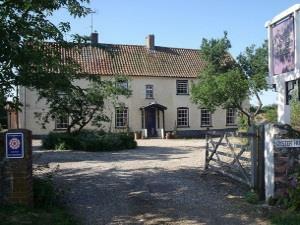 Our traditional flint farmhouse dates back to the C17th and retains much of its original character. Set amid lovely country gardens, our guest accommodation is set adjacent to the house in the old dairy building. This has been carefully restored to provide comfortable, light and airy ground floor rooms. Both double and twin rooms open directly onto a grassed courtyard, allowing guests extra privacy and convenience and giving you a pleasant outdoor sitting space. The rooms are furnished in a simple country style with en-suite bathrooms, colour TV, central heating and a tea/coffee tray and have views over the gardens to farmland beyond. Oyster House sometimes limits bookings to 2 or more days. Light and airy double room opening onto a pretty grass courtyard with cottage garden flowers and seating. Furnished in a simple country style with antiques and embroidered linen. Room may be suitable for elderly or guests with limited mobility. Views of south facing lawns and borders. courtyard sometimes limits bookings to 2 or more days. Courtyard room with private entrance opening onto grassed courtyard with cottage garden flowers and seating. Furnished in a simple country style with prettily embroidered linen and antique furniture. Views of south facing lawns and borders. Room can be made up as a twin or double to suit your requirements. Room may be suitable for the elderly or guests with limited mobility. Escape to the peace of rural north Norfolk and enjoy a comfortable and relaxing stay at Oyster House. Our guests can enjoy an award winning traditional breakfast made from the very best of local ingredients which is served in a pretty parlour in the farmhouse. Next to West Rudham Village Green. Driveway next to red phone box. Bus service X8 Fakenham/Kings Lynn stops outside gate. We have National Accessibility Scheme Mobility Rating of "Suitable for Elderly and Less Mobile".